We all do it. On the bus. In a meeting. At your desk. You’ll be hard-pressed to find a woman who doesn’t peel off her nail polish. It’s extremely tempting, especially if your manicure starts chipping. However, this can be highly damaging to your nails. In fact, you should never remove your nail polish this way. 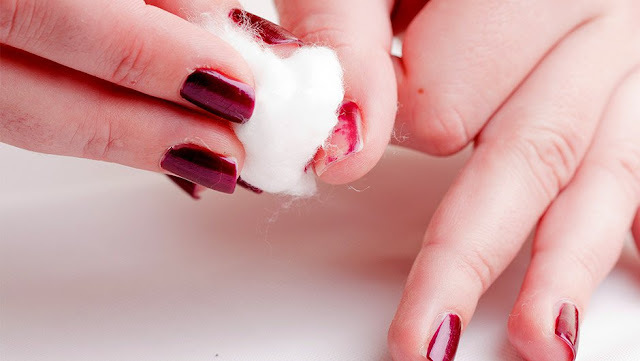 When you peel off nail polish, it takes off layers of your actual nail. You may not see the difference immediately, but doing this over time will make your nails thinner. Gel nail polish the worst culprit. Peeling off gel polish removes layers of your nail. This can result in your nails being rough in texture and discolored. Even worse, it can lead to brittle nails that constantly break. Take a break from nail polish and let your nails heal. Keep your nails short while they heal. This will prevent them from breaking. Don’t cut your cuticles. This can damage the new nail that is growing. ($9). It rehydrates and revitalizes your nails (plus, it smells good). Buff your the surface of your nails. This will help even out the texture. ($17.95). It will make your nails harder and stronger in just a few weeks. Drink lots of water. This will keep your nails and cuticles hydrated and help them heal. Check out these nails remover that won’t ruin your nails.